Place-making is peace-making! Portland, OR is one of four national demonstration sites supported by the Centers for Disease Control and Prevention to bring a health approach to violence prevention. Looking at violence before it starts means addressing root causes of violence. Issues like poverty, education, employment, health, and community cohesion. STRYVE (Striving to Reduce Youth Violence Everywhere) is a program of the Community Capacitation Center of the Multnomah County Health Department and addresses violence by empowering young people to be change agents in their communities and building cohesion through a greater sense of place. 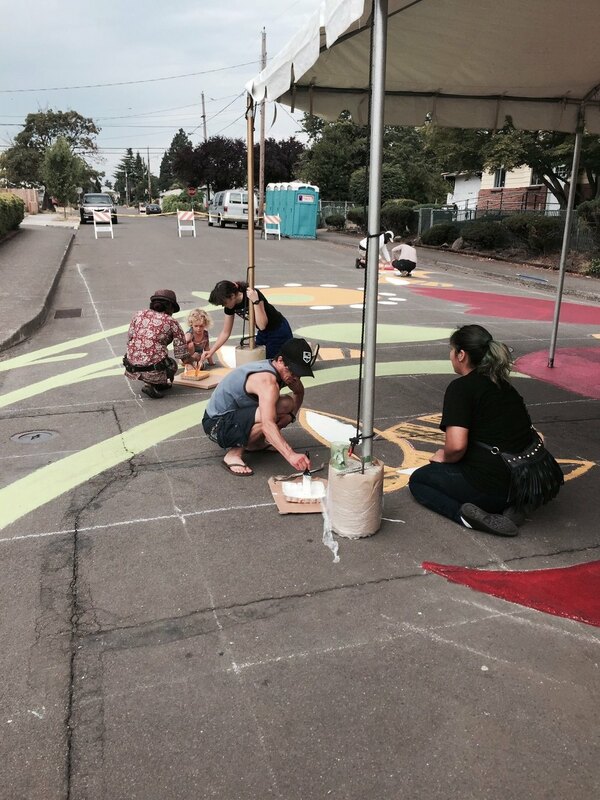 In 2014, STRYVE worked with POIC/Rosemary Anderson High School, Portland Community College, the Piedmont Church of Christ, and many neighbors and students to create a sense of place at N Killingsworth Ct. and N Borthwick. The intersection had previously been a place of conflict and violence with little ownership or identification. By transforming the intersection with a community and youth-led design effort, the community took steps to revitalize their neighborhood and empower participants. In 2015, STRYVE worked with neighbors in the Lents community of outer SE Portland on a similar effort. They continued with a 'community pollinator' theme, building awareness of community change agents and the importance of supporting natural resiliency and protections through pollinators and pollinator habitat. Completed on June 28, 2015 with the support of Lil Lentils Playgroup & Performance, STRYVEPDX, and many, many neighbors and friends. The project promotes place-making and peace building and is complete with a peace pole featuring eight languages that promote Peace on Earth. The project spans approximately 5,000 square feet and took three days to complete. By building a sense of community in our neighborhoods, we create connections, support and resiliency to counteract risk factors that may lead to community instability. It's completely within our power to retrofit our urban grid and public right of way to create a greater sense of community. Thank you to everyone who helped to make this project possible.